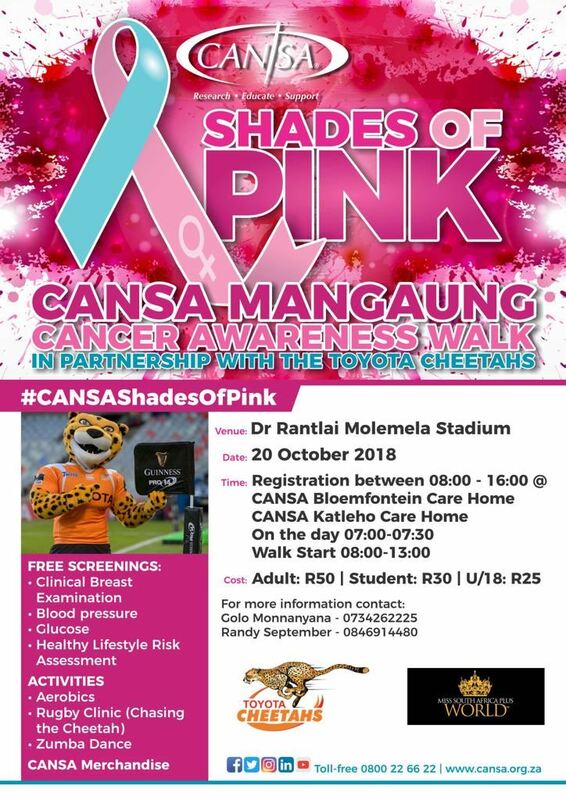 CANSA in partnership with the Toyota Cheetahs will be hosting the CANSA Mangaung Cancer awareness walk on Saturday, 20 October at the Dr. Rantlai Molemela Stadium. Registration for the fun walk can be done on weekdays between 08:00 and 16:00 at CANSA Bloemfontein Care Home and CANSA Katleho Care Home or on Saturday between 07:00 and 07:30 at the Stadium. Costs are R50 for adults, R30 for students and R25 for kids under the age of 18. The 5 km walk will start at 08:00 followed by other activities which includes aerobics, a rugby clinic (Chasing the Cheetah) and Zumba dance.